By the Rev. Atwell M. Y. Baylay. The Church of Balderton is dedicated in honour of St. Giles. We have evidence of the existence of a stone church here in the 12th century, in two fine Norman doorways, though both have no doubt been moved from their original positions. It is probable that the Norman church consisted of nave and chancel only, without side aisles and without a tower. In the 13th century the tower was built, and over the fine tower arch still exists, though blocked, one of those curious little doorways so often found in this position in early towers. Some have supposed them to be intended for giving access to the upper floor of the tower by means of a ladder in the nave. In the present instance there is a winding stone staircase for that purpose, though this may possibly be a contrivance added later. Others think that these doorways gave access from the tower to a balcony or narrow gallery commanding the church. Such galleries are to be found at Heckington and other Lincolnshire churches. Their object is obscure. They are certainly not singing galleries, being too narrow, too high up, and too dark. They may have been for observation of some sort, and perhaps were connected with some ceremonial ringing of bells. Possibly even earlier than the tower, the north aisle was added to the church. 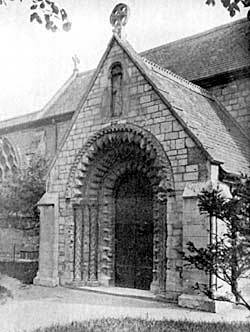 The Norman doorway would have to be moved, and, most singularly, was moved to the outer face of the new porch, a new and plainer doorway being set up as the entrance to the church. The cross on the gable of the porch is ancient, and so is the niche and figure over the doorway. I can form no idea of whom the figure represents. The drapery suggests a female subject, but no single figure of our Lady, without the Holy Child, was to be found in England before the Reformation, and I cannot trace any such feature here. The chancel is also of the 13th century, but has apparently been in great measure reconstructed at the restoration of the church. The westernmost lancet in the south side is certainly a "reading window," to give more light to the priest at his desk. In the 14th century the south aisle was added, or possibly an earlier one was altered. The plain windows in the south wall east of the porch, and the window at the east end, appear to be much earlier than the arcade, or the outer arch of the porch. Here again, the Norman doorway had to be moved. But this time it was made to fulfil its original purpose as the entrance to the church, and a good Decorated arch was set up in the outer gable of the porch. The type of foliage on the capitals should be noticed,—it is a striking contrast to what will be seen at Claypole,—and the very peculiar pinched-in bases of the pillars, evidently designed to give good room for the benching, of which so much fortunately remains, ornamented with hares and hounds, and of the type in which the back part of each bench formed a kneeling place for the people in the seat next behind. To the 14th century also belong the font,—of peculiar but not commendable design,—the outer wall of the north aisle, with fine net-tracery windows, and the re-handling of the tower, including a new west door and window, flanked by curious western buttresses, and the addition of a spire, whose crockets give it a somewhat Lincolnshire appearance, though the general design of spire and tower together is thoroughly Nottinghamshire. Large new belfry windows were constructed at the same time, of singular design. I do not know any other instance of such an early use of the "four-centred" arch. 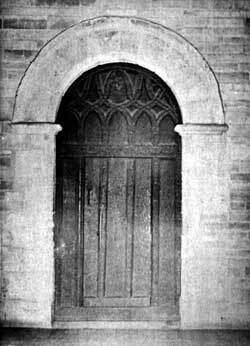 At the end of the 14th century or early in the 15th, the wooden door leading to the north porch was made. It is a fine and curious specimen, both as regards design and execution. In the upper part is a figure of our Lady and the Holy Child: and on a sort of transom below can still be read, "Jesu, mercy : Lady, help." The west door at Hawton is by the same hand. Later in the 15th century, we have the east window of the chancel, and a curious south chancel window, evidently intended to give more light to the choir than the older narrow windows afforded. I think the plain square piscina is of the same period. The arched recess opposite I take to be modern, though old stones may have been used in constructing it. Also towards the end of the 15th century, about 1475, was set up the rood-screen, of good workmanship and remarkable design. The great depth, from east to west, of the muntins1 is noticeable. The plain-faced tracery to the east suggests that a loft, placed on the screen, projected principally eastwards,—an unusual feature. On each side of the screen are figures over the central doorway. To the east, it is again our Lady and the Holy Child. The figure to the west can be of none other than St. Francis of Assisi. The dress, the attitude, the globe under the foot, leave no doubt. It is not unlikely that the screen may have been the gift of some devout layman who was a member of the third order of St. Francis, in connection with the famous house of Observant Franciscans at the Newark Friary. Judging from the fragments, of various dates, collected in some of the chancel windows, the church must have been rich in most beautiful stained glass, both of the 14th and 15th centuries. The church was restored about nineteen years ago, and then (after the senseless fashion followed by too many "restorations") lost its clerestory,—a great injury to the church in every way. The great tithe of Balderton was appropriated to the prebend of that name in Lincoln Minster, and is now in the hands of the Ecclesiastical Commissioners. There are six bells in the tower, all of them modern. The registers go back to the very early date of 1538. The church plate includes an ancient paten and chalice. I am very ignorant of these matters, but I should say the paten is the older, and has belonged to a larger chalice, of Elizabethan date, to which it would also serve as a cover. The chalice appears to me rather of Caroline date, and is a very gracefully designed thing. It is remarkable that the fonts, both here and at Coddington, escaped the destruction which befell so many fonts round Newark during the Civil War in the time of Charles I.
ANNA LEEK INDELITATAE | CHASTITATIS GENEROSA | VIRGO, FILIAE PRIMOGENITAE FRANCISCI LEEK GENEROSI | OBIJT ANNO RESTITVTIONIS | CAROLI REGIS PRIMO REDEMP | TIONIS NOSTRAE 1660 | AETATIS SVAE VICESSIMO. Thoroton, in his History, records that the manor of Balderton was sold by the heir of Giles Foster to "James Leek, gent., whose son and heir Francis Leek succeeded and left only a daughter, who was married to George Lascells of Elston." The daughter whom George Lascells married was named Mary, and the marriage took place at Balderton, 8th September, 1663. It is evident, from the brass recorded above, that Mary had another sister Ann, who died unmarried. Ann's burial is entered in the registers as taking place on 4th June, 1660. Note.—Indelitatae is the inscriber's mistake for indelibatae; and there can be little doubt that the phrase ''filiae primogenitae'' should be in the nominative case. J.S. (1) A word in general use among wood-workers for the principal uprights between panels. J.S.